The thing I continue to love about clay is the abundant opportunity to make subtle (or drastic) changes to my work resulting in a new creative avenue. I love the repetition of making a familiar form, but also enjoy altering the process to create something new and different in my clay vocabulary. Sometimes it takes a long time for the ideas swimming around in my mind to come to fruition – other times there are immediate results. Failure is often my best teacher. Here are some of my latest experiments in the studio. 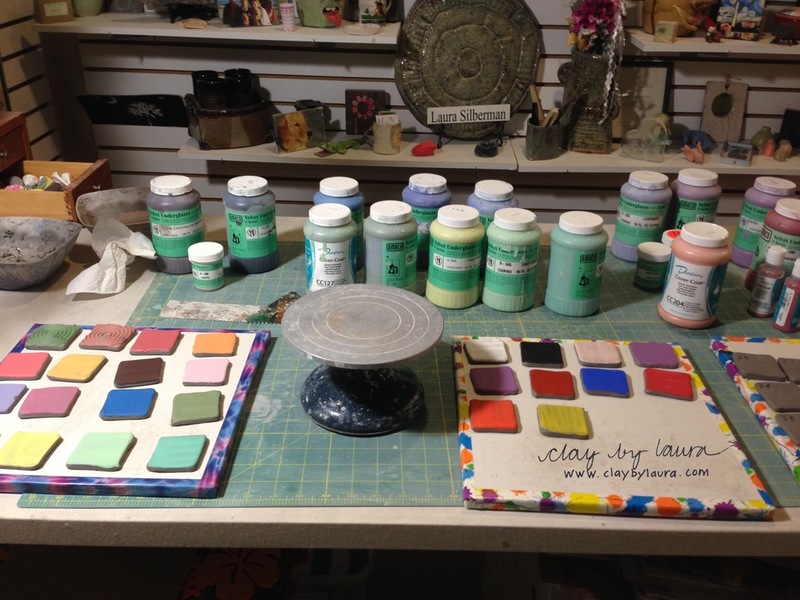 I learned about layering color at the Lana Wilson Workshop I recently attended. I made a bunch of test tiles to play with various color combinations. Learning a new process takes time and patience. I'm often surprised with the end results of experimentation. I've learned to document the color combinations I've chosen carefully so I can recreate the ones that I like. Here, I've updated a technique I used in the past contrasting a solid color inside with a plain outside. Now, I chose to highlight the outside texture of the bowl with some of the color. This is still a work in progress. I think next I'll play with using the color in the same way, but use a matt finish on the outside of the bowl to also contrast with the color and gloss of the inside. I was asked to create a series of pet urns for display at my veterinary practice Buckeystown Animal Hospital. I will make a customized pet urn for their clients on request.